The Foreign exchange market (also called Forex) has become a great way to manage and earn your money throughout the years, and it is undoubtedly one the most liquid financial markets in the world of exchange. In this market, you will find people that have experience (professionals in Forex trading who make their living from it), and people that have no clue of what they are doing. Usually, the people with just a little bit of experience (or none of it) don’t really know how to guide themselves with the technical analysis and fundamental analysis. They need to read a lot about the Forex market to be able to understand it. The truth is that it doesn´t matter if you are a beginner or an expert; you can always make mistakes when you are in this type of market. That is the main reason why we are going to highlight the principal things that you don´t have to do when you are part of this big market where anything can happen. The lack of a trading plan: To be a good trader it is necessary to be organized and to have a trading plan. Usually, the people start trading without having one and they just do whatever they feel the need to, and that is not the idea. It is something that can happen to both beginners and professionals, and it is necessary to avoid it. They also don’t have a second plan or a second strategy. It is important to have other plans because this is not something stable, and you need to earn full time in Forex. If you earn full time in Forex the results will better, and it only can happen if you have a good plan. Another common mistake is that people, usually, don´t know the amount of capital that they are going to invest. They don’t make any type of budget before they start. Failure to implement stop-loss orders: In the world of trading the stop-loss orders are important for trading success, and failing to implement them is a huge mistake made especially by the Forex trading beginners. Following everyone: This is one of the most known mistakes in this world, it’s something that happens a lot. Sometimes when you are a beginner, you want to learn by watching what everyone does; if you are a professional, sometimes you want to change your strategy because yours is not going the way you wanted. The problem is that following the herd is not always a good idea, everybody owns their strategies and maybe their strategy won´t work with you, and going out of your comfort zone could cost you some losses, maybe more than those that you are already having. Letting loses mounts: In the world of Forex trading, this is something that happens a lot. Frequently, when someone is trading in the Forex market and they start to lose some money, they get paralyzed and every opportunity of getting back that money is gone. So, it is necessary and fundamental to never give up, not even in the last minute and try to recover a little bit of what they just lost because if not, the losses will be growing and that is only going to affect the trader more and more. Trading in multiple markets: When you are a beginner, sometimes you can see yourself involved in the fact that you want more and more money. This can lead you to trade in multiple markets, but that is a great mistake because it can turn itself into a big distraction and will stop the trader in its way to becoming an expert in Forex That’s because he’s not trying to earn full time in Forex, which means that you have to focus on just one market. 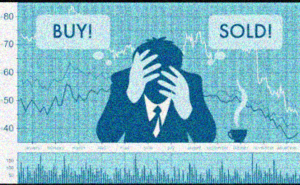 Letting your emotions control the way that you trade: In this part, it is not just a mistake at the moment of trading, but in your daily activities. This is why we will give you a small description of the principal emotions you need to avoid. Fear: It is normal that traders become fearful of starting in the market, especially when they haven´t mastered an operative trading strategy. Euphoria: It can be really dangerous, just because of the fact that can get out of hands and the trader can become over-confident and it can do things that can be a cause of regrets. Panic: That means that it may feel a little bit like fear, but so much worse. This kind of feeling paralyzes people, and you need to always be active and keeping an eye on your business. The most important thing is to focus on your trading strategy and to be sure of what you are doing.